Is there a way to move forward that is good for all? Maybe so. It's all a matter of perception: The noise from whale-watching boats may make it harder for orcas to "see" their prey underwater. And, allegedly, the noise from some whale-watch boat operators has made it harder for people to see a documentary film that suggests their boats contribute to the orca population's decline. Last month, Mark Anderson, president of the Orca Relief Citizens' Alliance in Friday Harbor, arranged to have a Q13 FOX (KCPQ) documentary about the effects of whale watching on orcas -- "Are We Loving Them to Death?" -- shown at the Friday Harbor House, a hotel that stands a couple of blocks from the San Juan Island ferry terminal. It didn't happen. The on-line Island Guardian reported that "Chef Kyle Nicholson, who also wears the 'Inn Keeper' hat, said he had received a number of complaints from commercial whale watching operations that the film cast their industry in a bad light, and would have a negative impact on attracting tourists to the islands to watch the whales." The Guardian reported, "Nicholson said he had not been aware the film was 'controversial,' and did not wish to put the hotel in the middle of a controversy, so he canceled the showing in the banquet room, and a reception at [the hotel's] Bluff restaurant that was to follow." The documentary -- which had aired in 2010 -- certainly did cast the whale watching industry in a bad light, reporting: "Study after study show[s] boats have a negative impact on almost every aspect of Orca behavior. For instance, in 2009, David Bain and J.C. Smith found the whales spend less time eating and more time swimming when boats are nearby. . . . In a 2008 study by Marla Holt, she found because of their incredibly sensitive hearing, engine noise can block between 88-100% of a whale's sonar signals. Human generated noise can also cause marine mammals to release increased amounts of stress hormones which are as harmful to them as they are to humans." That's pretty unambiguous. But evidently, some of the callers were reacting to it sight unseen. The Island Guardian reported that it had "contacted a number of the owners of commercial whale watching companies and found the controversy is alive and well even within their industry, with some operators stating that while then had not seen the film, they would not see it, and did not think it should be shown at the Friday Harbor House." Southern Resident Killer Whales (aka Puget Sound orcas) were listed as an endangered species in 2005. Puget Sound chinook salmon have been listed since 1999 as a threatened species. Columbia River salmon populations, well within the SRKWs' range, have been reduced from an estimated pre-cannery population of 10 to 16 million (some would say 30 million) to perhaps 2 million in an average year. Five Chinook populations that spawn in the Columbia or its tributaries are listed as threatened or endangered (as are several California populations within the killer whales' range); others have already dsiappeared. .
And it turns out that Fraser River salmon, which -- in the absence of enough fish from Puget Sound and the Columbia -- have become the killer whales' staple (at least during the summer; no one really knows what they eat during the winter), aren't entirely organic. 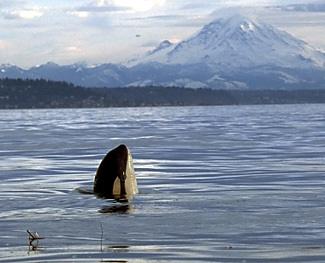 Killer whales living in Puget Sound have accumulated a lot of toxic substances in their fat. In fact, says Sam Wasser, director of the University of Washington's Center for Conservation Biology, they carry "one of the highest levels of PCB [and other toxins] of any mammal in the world." The National Marine Fisheries Service (NMFS) has taken note. Because the boats can disturb whales, NMFS has published "regulations under the Endangered Species Act (ESA) and Marine Mammal Protection Act (MMPA) to prohibit vessels from approaching killer whales within 200 yards (182.9 m) and from parking in the path of whales when in inland waters of Washington State." NMFS explained last year in its Federal Register notice that the "purpose of this final rule is to protect killer whales from interference and noise associated with vessels. We identified disturbance and sound associated with vessels as a potential contributing factor in the recent decline of this population." Exposure to high levels of toxicants (e.g. PCB, PBDE and DDT), which are stored in the whales' fat. "Hypotheses 2 and 3 likely interact with Hypothesis 1," the Center's web site explains, "since the impacts of boats and toxicants may be exacerbated by the lack of prey." Scientists who have studied the subject -- and who are quoted or paraphrased in the documentary -- say that boat noise compounds the effects of prey scarcity. They basically echo the explanation of the Orca Relief Citizens' Alliance's Anderson. The Friday Harbor resident makes it pretty simple: "In times of dwindling salmon the presence of boats accelerates the starvation of the whales by increasing their need for food and decreasing their ability to obtain it." Anderson explains that "if you ask a population biologist . . . the effect of the boats is to artificially lower the carrying capacity of the local environment." With boats around them constantly, the whales spend less time feeding, more time diving and doing other things that use up their supplies of energy. They lose weight. Therefore, they metabolize their toxin-laden fat, increasing the stress on their bodies. "Vessel traffic may have contributed to Southern Resident Killer Whales becoming endangered," David E. Bain, of the UW's Friday Harbor Labs, and colleagues have written. They've suggested that an. "increase in distance traveled in the presence of vessels would result in increased energy expenditure relative to whales who can rest while waiting for affected whales to catch up. Rates of display behavior increased significantly as the distance to the nearest vessel decreased. Transitions between activity states were significantly affected by vessel traffic, indicating a reduction in time spent foraging as was observed in Northern Residents. If reduced foraging effort results in reduced prey capture, this would result in decreased energy acquisition." Understandably, some people don't like to hear things like that. The Island Guardian reported that it had "contacted a number of the owners of commercial whale watching companies and found the controversy is alive and well even within their industry, with some operators stating that while then had not seen the film, they would not see it, and did not think it should be shown at the Friday Harbor House because it was -- as more than one stated -- 'factually incorrect' and 'slanted' against the industry." KCPQ reported: "Some whale watch operators are in denial. 'Affecting their sonar, I have yet to read a study that shows any impact on their sonar,' says Shane Aggergaard. Aggergaard says it's unfair to punish the whole industry when most captains follow the rules by slowing down within 400 yards of the whales and cutting their engines at 300 feet. But the whale watching business is built around finding and chasing the animals all over the ocean six months out of the year. " Indeed, Bain and colleagues reported that each subgroup of killer whales "was within 400 m. of a vessel most of the time during daylight hours from May through September." Anderson agrees. "The whale watch operators are always in the denial business," he says. "They point to the private boaters as being the big problem." He concedes that private boats contribute, but he suggests that they wouldn't be much of a problem without the tours: "They're not very good at seeing the whales," he says. Most recreational boaters will cruise right past a pod of whales without even noticing, Anderson has observed, but if they spot a whale-watching boat, they'll head right for it. If you put a flotilla of whale watch boats on the water and a private boater sees it, he'll probably go over. Basically, "it's an attractive nuisance." But he doesn't concede that's the only harm that whale-watching boats inflict on their quarry. "Even at the current regulated distance of 200 m, you can completely blind the sonar . . . with one engine," he says. There are a lot of engines. He's not sure there's an accurate count of boats operating around the whales but says even cutting the overall number from 150 to 100 wouldn't make an appreciable difference, according to research. And boats come from a significant distance, including from neighboring Canada. "All their boats have twin outboards, 350s, which are just hell" on the whales, he says. The research started before 2001's 9/11 terrorist attacks. Right afterward, most ocean shipping ground almost to a halt. During that abnormal period, the noise was measured at its lowest level -- and the whales exhibited the least stress. As the Proceedings paper puts it, this "noise reduction was associated with decreased baseline levels of stress-related faecal hormone metabolites. . . . This is the first evidence that exposure to low-frequency ship noise may be associated with chronic stress in whales " In other words, the "normal" background of vessel noise affected the right whales, but without 9/11, there would have been no way to tell. Background noise -- from smaller, higher-pitched vessels -- may affect SRKWs, too. Needless to say, the whale watch industry doesn't concede that its operations do the killer whales any harm. It sees a manufactured crisis. There "wasn't a conflict" over the KCPQ documentary, says Bill Wright, president of the Pacific Whale Watch Association. A couple of businesses -- in addition to the Friday Harbor House, the Sea Shepherd Gallery later gave and then withdrew permission to show the film there -- simply refused space to "a group that's been agitating for over a decade and has been less than truthful." There is obviously no love lost between Anderson and the whale-watching industry. The Orca Relief website carries an article in which Anderson says that "[w]hile those financially involved [in the whale-watching business] can continue to try to use their own ignorance of the science behind the new federal guidelines . . . there are now over fifty scientific papers on boat/whale interactions involving resident orca, by scientists from five or more countries, all of them showing negative effects. This . . . report further comes after much of the above science was re-checked by research done by the National Marine Fisheries Service. . . Dr. Lynne Barre, NMFS' lead scientist in this process, specifically confirmed the ability of motorized boats to blind orca sonar at 100% levels even at the distance of 200 m."
Wright suggests that the science doesn't point an accusatory finger at the whale-watching industry at all. "Go directly to Lynne Barre," he says. Or "go directly to [NOAA regional administrator] Will Stelle. . . . Just go to anyone . .. . and ask them how we're doing, and they'll say we're doing great." If you do go to Barre, she says that "for the most part, the industry is highly compliant" with the regulations that say boats must keep 200 meters away. (The far larger number of recreational boaters tends to be less compliant. She agrees with Anderson that the whale watch boats draw recreational boaters to the whales. But she adds that the whale boats model good behavior, keeping their required 200 meters away.) She also says that 200 meters represents a compromise between the best interests of the killer whales and the industry. Research indicates boat noise can affect whales up to 400 meters away, but the whale-watch operators have said that staying that far away from the animals would kill their business. It's "a bit of a balancing act," she says. It is clear, Barre says, that boat noise affects the behavior of individual whales. It is not clear how this affects the whale population. She assumes that the affects of boats, toxins, and the lack of food are cumulative. One kayak in the path of a killer whale pod may be harmless. Forcing the whales to run a constant obstacle course of kayaks and power boats may be far from harmless, especially "if you start with the premise that there may not be enough fish." The lack of chinook is, indeed, the main cause of killer whale stress, but when there aren't enough fish around, boat noise can raise stress, too, according to a paper just published by Wasser, former Center for Conservation Biology Ph.D. student Katherine Ayres, and colleagues in the journal PLoS ONE. "Our results suggest that prey availability has a greater physiological impact on SRKWs than does vessel traffic," the scientists write. "However, we cannot yet rule out a cumulative effect of vessel traffic on the overall SRKW stress response, particularly during years of relatively low Fraser River Chinook abundance." Anderson willingly concedes that if there were plenty of chinook salmon, boats wouldn't do much harm. And in relatively good chinook years, they don't. He and virtually everyone else realizes that the underlying problem is a lack of chinook. But not everyone realizes that the problem goes well beyond Puget Sound. In fact, the fate of Southern Resident Killer Whales may be tied to the fate of the lower Snake River dams. Wasser and his colleagues have found that Columbia River system chinook seem crucial to the welfare of the killer whales. The animals seem best nourished in early spring, before they enter Haro Strait and Puget Sound, the PLoS ONE paper explains. Out there beyond the straits, Columbia River fish are presumably what they eat. And, at a hungry time of year, those fish are full of fat. "We believe that the early spring runs that they're eating before they get into the Haro Strait and the Strait of Juan de Fuca are probably the most vital of all." Wasser says. "We think the Columbia River is a really important source of their chinook." Critics of the federal government's most recent legally doomed biological opinion on operation of its Columbia River system dams have pointed out that unlike a recent biological opinion on operation of the Central Valley Project and California State Water Project, this one relied on hatcheries to make up for the salmon killed by the dams, without acknowledging that in order to recover, the killer whales would need more salmon. And it didn't take into account that if climate changes, salmon spawning at high altitudes -- in California, high-altitude spawning habitat lies above the Shasta and Folsom dams; in the Columbia River system, it lies in central Idaho, above the lower Snake River dams -- may be all that stands between the orcas and extinction. The SRKW population "declined by 20 percent in the late '90s and they are not really recovering," Wasser says. "Where do we put our effort?" He thinks "a lot more effort has been put into managing the boats than managing the fish" because that focus enables some people to avoid dealing with the lack of salmon. He argues that "what they really need to do is to recover this endangered species of chinook salmon that these endangered whales are eating." He suggests "it's a matter of priorities." Not that he figures the boats are innocuous. "In years when there's very low fish, boats have an added impact," he says. And in any year, "there's no question that there are boat effects. There's absolutely a behavioral impact. There's no question about that." When boats are around, "you see things like increased swimming speed and decreased socialization . . You see whales are spread much more widely" to feed. Although the feds have established regulations for how close boats can get to the orcas, Wasser says, "the thing they don't regulate is the number of boats. And they have no intention of doing that." Anderson suggests that one could solve the killer whales' boat problems without limiting the number of boats at all -- by just providing the animals a large "room" that no whale-watch boats could enter. This room "would be on the west side of San Juan Island: that's where the salmon are." The whale-watching boats "could have the rest of the ocean." He envisions a place in which the killer whales "could eat in privacy . . . eat, mate, rest, whatever they do in privacy." He figures this one simple measure would basically do the trick. Will NOAA try it? Stay tuned.